Fun Fact: This was originally for the tag team titles, but the Headshrinkers lost the titles to Shawn Michaels and Diesel on the August 27 house show in Indianapolis. The funny part is that the title change was mentioned for the first time on Live! With Regis and Kathy Lee, as Shawn and Diesel were guests on the show the morning of Summerslam. Lawler then mentions the title change at the top of the broadcast. Fun Fact: This is the first time the Women’s Title was contested at a Summerslam. Fun Fact: Justin’s cousin, Vinny, and Scott’s friend Gary actually owned yellow Razor Ramon shirts, which debuts on camera at this show. Fun Fact: The match was actually built up quite well and over a number of weeks. It all started when Ted DiBiase appeared on Raw and announced that he had signed Lex Luger to be in his new Corporation. Luger’s friend Tatanka went on record and announced he believed DiBiase. Over the next few weeks, Tatanka kept catching Luger in compromising situations, but Luger kept denying it. The two decided to square off here at the PPV to settle their issues. In a one of those classic unintentionally funny moments, Todd Pettingill is manning the WWF Superstar Line and is asking fans if they thought Luger had sold out or not. Well, one astute young fan claimed he thought “Tatanka sold out,” the phone was immediately cut off and the segment ended right away. Nice call screening. This is the second time this happened, as on the call-in portion of the Sunday Night Slam show the week before, a fan said Tatanka sold out. By the way that call-in show with Vince and Jerry is also unintentional comedy, as the collection of loser fans and hang-ups is classic. Fun Fact: This show marked the return of the British Bulldog, who had spent all of 1993 in WCW. Fun Fact II: This is the first cage match on PPV since the Ultimate Warrior vs. Rick Rude title match at Summerslam 1990. Fun Fact: Following Wrestlemania X, rumors began swirling that there had been Undertaker sightings around the country. Every week, the WWF would air little vignettes with local American Joes claiming they saw the Undertaker in their town. Taker was spotted at delis, construction sites and supermarkets, but no one could grab hold of him. Soon after this, Ted DiBiase claimed that he had bought the Undertaker’s services, and that he had an in with the Dead Man because he has originally brought him into the WWF (nice continuity). DiBiase’s Undertaker began wrestling on WWF shows, and was close enough to the real thing that most rubes in the audience bought into it. For die-hard fans, though, it was obviously not the real Taker, as the new one was noticeably shorter. Paul Bearer then showed up on the scene denying that DiBiase had bought Taker’s services, claiming that he was still in charge of the Dead Man. Well, the WWF then hired Leslie Nielsen to clear up the mess, and he, of course, accomplished nothing in a series of about 5 skits leading up to Summerslam. 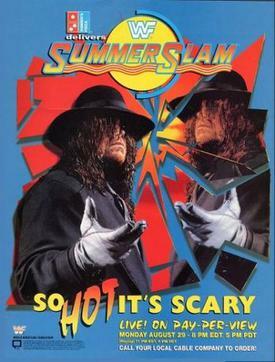 So, Bearer claimed that his Undertaker would show up at Summerslam to take out DiBiase’s Undertaker.